In late 2016, we predicted that digital home assistants – think Amazon Echo and Google Home – would truly come into their own (and your home) in 2017, and we weren’t wrong. Heading into 2018, even more gadgets are joining the Internet of Things, or IoT; the network of ‘smart’, internet-connected devices in the home and beyond. This encompasses everything from smart TVs and automatic kettles to food-ordering fridges, self-driving cars and app-controlled lights, heating and locks. It’s estimated that in a matter of years it will be almost impossible to buy an electrical appliance that isn’t online. 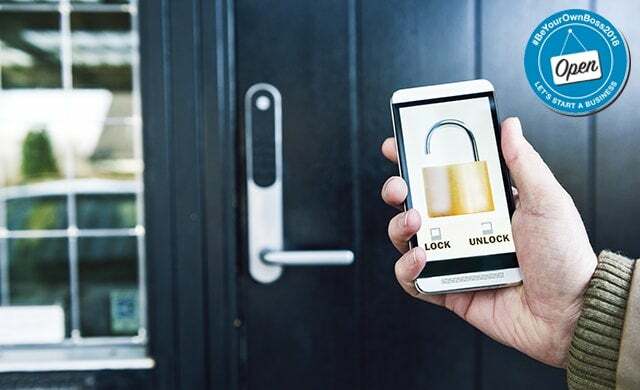 But convenience and connectivity come at a price – and thanks to the valuable data that IoT devices collect about their users, they’ve become tempting targets for cyberattacks, which can leave the whole home vulnerable. If the audacity of such an attack has made your blood boil, this could be the start-up idea for you. But why else should you launch in this sector? It’s estimated that by 2021, 22.5 billion devices worldwide will be connected to the internet. Manufacturers without security expertise are racing to get in on this, developing products which often end up unsecured, with guessable default passwords and unpatched operating systems that don’t update automatically – leaving an opportunity for tech entrepreneurs to provide these missing security measures themselves. Following a string of heavily-publicised security breaches, these measures will likely be in demand as consumers wise up to the risks posed by their gadgets. Notably, the world faced the consequences of an IoT attack on 12 May 2017, when WannaCry ransomware infected over 230,000 computers in more than 150 countries. Devastatingly, up to 70,000 NHS devices – including MRI scanners, operating equipment, blood storage units and computers – were affected, with hospitals forced to refuse patients and divert ambulances in an incident reported on by major media outlets, including the BBC. Israel-based start-up Argus Cyber Security, for example, specifically protects smart cars from cyberattacks, while Dojo-Labs has created a product which monitors a home’s network and all its connected devices to protect them from unauthorised access. Meanwhile CyberX’s XSense platform gives businesses in manufacturing, energy, water, chemical and transport industries a dashboard which reveals IoT security threats in real-time. “We’re in an era where consumers and businesses expect to be able to connect everything to the web. Yet many IoT devices today lack even the most basic security protection, making them easy targets for hackers. “Staying secure online has never been so important, which is why we can anticipate more start-ups capitalising on the fast-growing and lucrative IoT security market. “I’m sure we’ll see new IoT manufacturers that embed better security into their connected devices from the start and use security as a key selling point to their users. At Cloudview, for example, we saw an opportunity to enable businesses to use a simple browser to securely access, manage and store visual data from one or many CCTV systems connected to the internet.